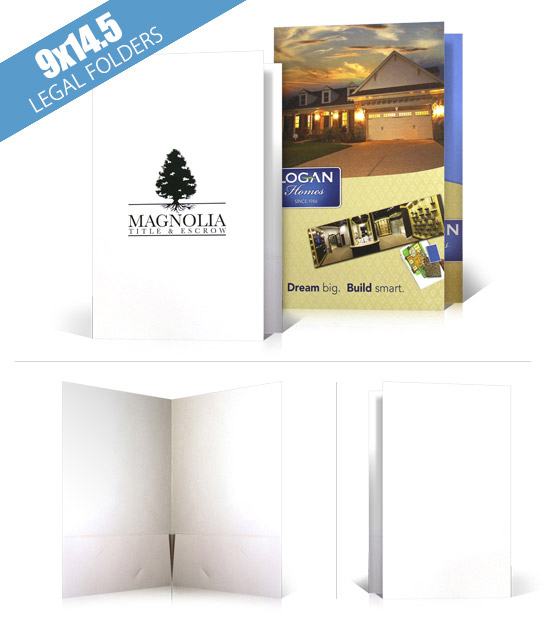 The Legal Size presentation folder is a larger folder at 9x14.5". 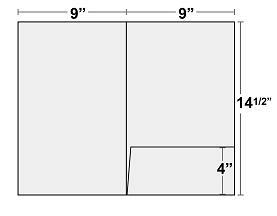 The bigger size is perfect for your legal sized inserts and documents. This is a very popular size for law offices, accountants, as well as title and escrow companies. 4/0 - Color 1 Side allows you to print the front and back cover as well as the pockets! With this option you can print in full color with full bleeds. 4/4 - Color 2 Sides has the same options as 4/0 but gives you the ability to print on the inside as well. DESIGN IT YOURSELF: Download a layout template formated to the most popular design programs like Illustrator, InDesign, or Photoshop (choose the appropriate link labeled "Download Template" above). CUSTOM DESIGN QUOTE: Send your design ideas along with any files you may have to our sales department and we will send you a quote. *Call (866) 936-5337 x2 to get started. 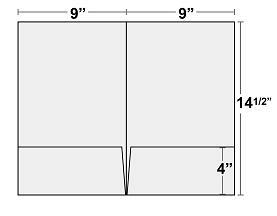 12pt C2s - 12pt refers to the stock's thickness and is the industry standard for presentation folders. We only offer C2s! C2s indicates that it is coated 2 sides (We do not offer C1s as it a step down in density and durability). Our 12pt C2s is a premium stock and is a great choice for presentation folders! 14pt C2s - When you need a thicker option with even more durability, then 14pt C2s is the perfect choice. It has the same premium properties as our 12pt but it's even thicker. Gloss is a most popular option and is a great choice for any folder. Matte is a great option as well. It has increased popularity recently and is the first choice for many designers. It is a flat finish without the glossy look. 4/0 refers to 1 side of the printed sheet which includes the front of the folder, the back of the folder and the front of the pockets. 4/4 refers to all panels of the folder including the panels behind the pockets. Our standard folders are printed using 4 color process. If you have spot colors we will covert them to 4 color process and send you a proof to approve. We allow the image to bleed off the edge if you choose to. We will email you a PDF Proof for your approval when you select Online Proof (PDF). These PDF proofs are free and unlimited. You can reject art and upload new art as many times as necessary for no additional charge. If your order is color critical, we recommend that you purchase a high resolution hard copy proof. This proof will show you what the printed piece will look like in terms of color. As part of any Presentation Folder order we will do up to 30 minutes of FREE artwork prep to insure that it will fit properly on our templates and print at a high quality. All turnaround times are based on business days, Monday through Friday and excluding all holidays. Turnaround represents the time required to produce your job before it ships. This does not include shipping or transit time. Turnaround times begin once you have placed an order for a job, uploaded artwork to that job, and approved the online PDF proof. The job must be approved by 12 noon for that day to count in the production time. Example: If a new order is placed on a Monday and the artwork is approved that same day by 12 noon PST, it will ship on that Friday under a normal 5 day turnaround. Please note: if the artwork is found to have issues that will affect the print quality, your job will be placed on hold until the issues are resolved. Once issues are resolved and the turnaround time will start over from that point.